Somewhat belatedly, I realized I should throw together some sort of explanation for what this series is and why you might want to read it. I figured an FAQ would be more fun to read and write than a rant, so I went with that. The Citadel of the Last Gathering is a series of novels I've been working on for almost a decade now. There will eventually be nine novels in total, along with a handful of short stories. Well, that gets complicated. First and foremost, these are fantasy, but that could mean a lot of things. In this case, it actually does mean a lot of different things: because the books incorporate time travel, the sub-genres change from novel to novel. The first book is essentially ancient world, the second is sword and sorcery, the third is an amalgamation of Victorian fantasy, steampunk, and some related genres... you get the idea. If you're inferring elements of SF from the presence of time travel, you're on the right track. While the mechanism is magical in nature, I'm not treating it as a throwaway concept. I've put some effort into crafting the rules of time travel and taking it seriously. In quite a few ways, I'm treating this as a science fiction story occurring in a fantasy setting, rather than a fantasy story with a couple SF tropes. No! I promise, the last book won't end with them going back in time and destroying magic or something. This isn't occurring on Earth - it's a fantasy world. Eagle-eyed readers may have noticed I haven't named the planet... and there's a reason for that. With very few exceptions, I hate it when SF and fantasy authors create cutesy names for their worlds. While I appreciate it from a branding perspective, it just doesn't make sense. Historically, people on Earth have typically assumed their world is the only one and just named it accordingly. That's why our planet is still called a synonym for dirt. I'd expect cultures of a fictitious world to act similarly. I considered having a few cultures do something like this early on in the series, but I decided too many people would assume that just meant it took place on our Earth, which... see the last question. Kind of. The main character is sixteen in the first novel, which - by some definitions - makes it a YA series. On top of that, the content tends to lean towards a PG-13 level. That said, she grows older as the series progresses. The content may get a little darker at times, but not exceedingly so. Also, a lot of YA books follow a pretty standard formula. It should be pretty obvious from the first book this does not. Alaji, a young woman from the distant past, who finds herself on an adventure spanning countless eons. Along with the spells known to her people, she has developed the ability to skip back in time a few seconds, a simple-sounding effect which makes her a lethal foe. She is an outsider everywhere she goes, both in appearance and customs. As she travels, she will need to determine her place in a vastly complex world. Other major characters will come and go - some may even overshadow Alaji as the primary lead for a book or two - but the series will tell her story. She'll also be the only character to appear in every novel. How about romance? Is there a love interest? There will be some romance eventually, but not for quite a while. It'll be a factor in the later books, but it's never going to be the primary point of this series. I like a good love story as much as the next person, but I'm a little tired of a couple meeting and discovering they're soulmates. That can be a fine premise, but it's been done to death. Will I like these books? I hope so! Most reviews I've gotten have been very positive. The few tepid exceptions generally cite time travel as the element the reader disliked. I don't think genre fans familiar with the trope will have an issue, but if you've never encountered a time travel story you enjoyed, this probably won't break the pattern. I don't think I've made the books too complicated, but I do assume readers will be familiar with the concept of time travel and will be willing to explore some unusual spins on the idea. Why should I read them? The settings are dynamic, shifting from book to book, as the world is transformed by geological changes, a shifting climate, evolution, and catastrophic magical events... not to mention Alaji's actions, which will leave a lasting mark on humanity, the world, and history. It's fantasy at a very large scale, filtered through Alaji's changing perspective of the world she's altering. All of that on top of the action, comedy, and suspense you'd want from a genre series - these books are both philosophical and fun to read. It's by far the most ambitious project I've ever undertaken, and I'm extremely proud of how the books are coming together. I hope you'll give them a shot. If you're a fan of a different e-reader format, I apologize. I used to offer books on other platforms, but the sales never justified the effort. When Amazon started offering promotional options in exchange for exclusive access, I couldn't pass up the opportunity to reach a larger audience. 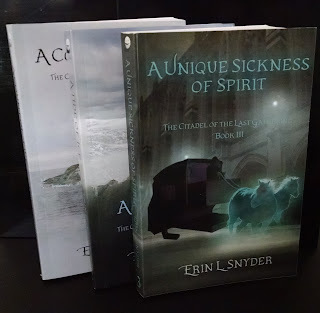 A Unique Sickness of Spirit, Book 3 of The Citadel of the Last Gathering, will be available for the Kindle on October 6th. You can pre-order now and get it delivered to your device the moment it's out. Eventually, the path came to the remains of a stone bridge, which reached only a third of the way across a chasm several hundred feet wide. Alaji approached to examine the stonework. “I won’t go far,” Alaji promised, taking a few steps onto the structure. Vines hung from the edges, and moss grew everywhere. “It’s beautiful,” she said. “You’re assuming it’s not waiting for us down there,” Phaesha said. “Well, I don’t have a better idea.” He turned to the others in case they did, but he was only met with blank faces. “I’ll go first then.” He lowered himself over the edge and slid down in as controlled a manner as possible, knocking several rocks loose as he did so. “I’m alright!” he called up, once he’d reached the bottom. “The smell is awful, but other than that it looks fine.” He stood up and began brushing the dust from his back. Behind him, he heard the sound of stones shifting. He stepped forward to give Alaji or Phaesha room. “Yemerik! Look out!” Alaji screamed. He turned to see something emerging from beneath the ruined bridge, crawling from a hidden cavern cutting into the hill. He could tell it was large – at least twice as tall as he was – but beyond that, it was a dark shape shifting in shadows. Yemerik started away across the bottom of the ravine. Then, ahead of him, he saw a large rock lift up as something pushed it out of the way from underneath. He turned back. The thing coming from the bridge was joined by another, slightly smaller but still more than eight feet tall. Now that they were in the open, he caught a bit more detail in the moonlight: long slender limbs attached to fat, round bodies. With a quick incantation, Phaesha hurled a blast of fire at the two by the bridge. They shrieked and covered their faces, though they’d barely been touched by the flames. In that instant, the light revealed green flesh spotted in warts. Alaji stepped into the chasm and began sliding down. One of the creatures heard her and turned. Alaji jumped as she slid and stepped back in time mid-leap. Once again, the creature’s back was turned to her. She buried her knife into the pale green skin on its back. It cried out in rage and pain and whipped around, throwing her off to one side. Alaji struck the loose stone hill and skidded down to the bottom. The creature turned toward her, baring its teeth. With a twist, Alaji arced her hand upward, trailing fire behind. Once again, the creatures shielded their eyes and leapt back with a cry. Phaesha gave a shout and charged down the hill, kicking her legs forwards as broken slabs of rock slid under her. One of the creatures turned to meet her. It swung a clawed hand at her head, but she ducked beneath the attack and sliced into its side with her sword. The monster screeched in pain but gave no ground. Instead, it grabbed for her. Narrowly, she avoided its reach and stabbed into its elbow, catching it in the joint. The creature growled, then lifted its arm, throwing her backward. It lunged after her, but was turned back by flame. “They’re afraid of fire!” Alaji cried out, a moment after hurling the flame that pushed back the creature. “Not fire!” Yemerik yelled, running towards the two women. “Light! They’re trolls! Afraid of light!” He almost reached them when a hand caught his ankle and pulled him off his feet.